WASHINGTON — Attorney General William Barr on Wednesday appeared to embrace longtime GOP talking points about the Russia investigation when he raised questions about whether the FBI followed its own rules. At a Senate budget hearing, Barr — who expressed skepticism about special counsel Robert Mueller's investigationbefore President Trump made him attorney general — endorsed a widespread GOP view that the investigation may have involved inappropriate surveillance of the Trump campaign. He said he would conduct a review of the matter. "I think spying did occur" on Trump's campaign, Barr told a subcommittee of the Senate Appropriations Committee. "The question was whether it was adequately predicated." Barr said he hasn't concluded there was wrongdoing, but "I need to explore that. I think it's my obligation. Congress is usually very concerned about intelligence agencies and law enforcement agencies staying in their proper lane. I want to make sure that happened." He added, "I have no specific evidence that I would cite right now, I do have some questions about it. I have concerns about various aspects of it." President Donald Trump and Republicans in Congress have long argued that the Russia investigation had its origins in a group of biased FBI leaders who bore animosity toward Trump, including then-Director James Comey and Deputy Director Andrew McCabe. Both men have denied that they acted out of any bias, saying there was a trail of evidence of Trump campaign contacts with Russians they would have been negligent not to follow. Two FBI employees who played an early role in the investigation, Peter Strzrok and Lisa Page, did denounce Trump in text messages that later became public. Mueller removed them from the team when he learned of the texts. In the end, Mueller's investigation found no criminal conspiracy between the Trump campaign and Russia, according to Barr's summary of its principal conclusions. Barr's embrace of longtime GOP talking points casting doubt on the origins of the Russia investigation came shortly after Trump denounced the probe as "an illegal investigation," "crooked," "an attempted coup," and "treason." Given a chance to distance himself from those comments by Sen. Jack Reed, D-R.I., Barr declined. "I'll use my own adjectives," the attorney general said. 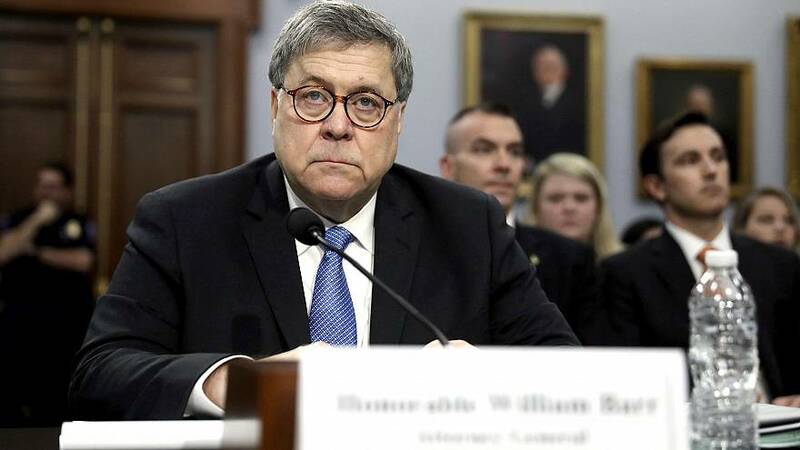 Barr's comments followed House testimony Tuesday in which he revealed that an inquiry by the Justice Department's Inspector General into aspects of the Russia inquiry was almost finished. The inspector general, Michael Horowitz, has been looking into how the FBI obtained a warrant in October 2016 to monitor the communications of Carter Page, a former foreign policy adviser to the Trump campaign who had traveled to Russia and had previously been the target of recruitment by Russian intelligence officers. Horowitz's team has also asked witnesses about some of the informants the FBI used in the early stages of the investigation, including a Cambridge professor, Stefan Halper, The New York Times reported Tuesday, citing people familiar with the inquiry. Republicans have raised questions about the Page warrant because they say it relied on information from a dossier by Christopher Steele, a former British intelligence officer who was conducting opposition research paid for by Democrats. They also question the role of Halper, who had contracts with the Pentagon and longstanding relationships with British and American intelligence agencies. Barr took pains to say he wasn't questioning the actions of the FBI as a whole. "I don't like to hear attacks about the FBI because I think the FBI is an outstanding organization and I think Chris Wray is a great partner for me," he said, referring to the current FBI director. "I feel I have an obligation to make sure that government power is not abused. I think that's one of the principal roles of the attorney general." Barr said he hasn't set up a review team yet, "but I have in mind having some colleagues help me pull all this information together and letting me know whether there are some areas that should be looked at."